In 1880 the US Lighthouse Board decided to build a set of range lights on Tinicum Island, NJ in the Delaware River. Range lights are a system of two or more lights used to guide ships through narrow channels with dangerous shoals nearby. Most ranges consist of a lower Front Light and an elevated Rear Light. When the lights are lined up one above the other the mariner knows he is in the proper channel. 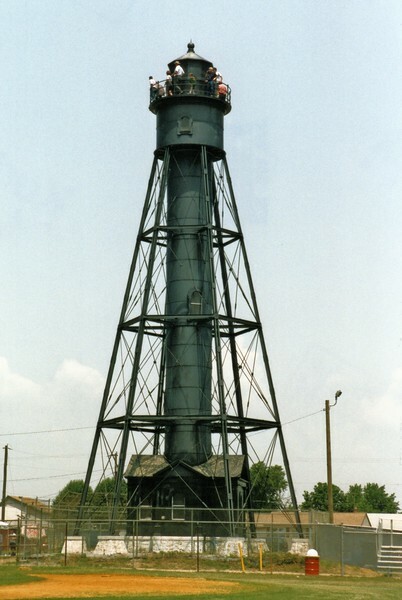 A steel skeletal tower was erected as a rear range light that stood eighty-five feet tall and was located 5/8 of a mile from the front light. The supports for the legs were attached to stone foundation stones sunk 4 1/2 feet into the ground. The legs are in a hexagonal shape around a circular staircase tube leading to the lantern room.